As an Ebay and Etsy seller (this works for Shopify and all ecommerce sellers too) I have found that the most questions I get are about how to use Priority Mail from United States Postal service! The cool thing is that you can get free boxes, insurance, etc. The hard part is that it can be a wee bit confusing when you are getting started selling online! So functionally, unless you item is super heavy or super big, Priority Mail is a great way to go! Last but not least, if you are printing labels from your home, you can request a pickup from your local mail carrier and never even leave your house to do your shipping! The coolest thing about shipping with Priority Mail is that the USPS will give you free boxes, which can reduce your costs of doing business. 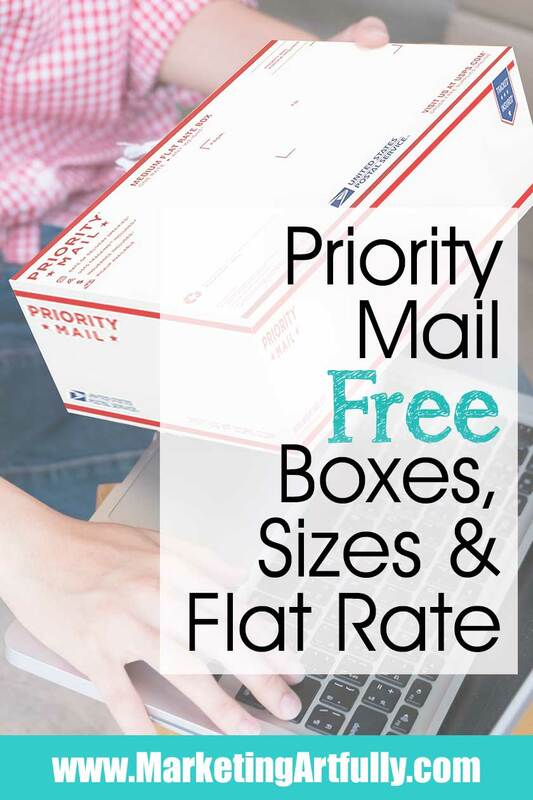 There are several types of free boxes including flat rate, general, envelopes and mailers. PLEASE NOTE, PRICES QUOTED ARE FOR COMMERCIAL MAILINGS PURCHASED THROUGH YOUR EBAY OR ETSY STORES. PRICES MAY VARY DEPENDING ON WHERE YOU BUY YOUR LABELS. Starting with the ones that come to mind for all of us is the Flat Rate boxes… the old, “if it fits, it ships” boxes. These come in standard sizes like Small, Medium and Large. You can order them in quantities of 10 or 25 and your postwoman will bring them right to your door! Starting out small, there is a small flat rate box ($7.50) that is almost the same cost as the flat rate padded envelope ($7.55). These are the cheapest ways to ship if you have something small and heavy (if it was lighter than 16 ounces you might do better to go with first class shipping rates). The small box is super thin so if I have something that is a bit wider and fragile, I will put it in a 6″X4″X4″ and then put it in the padded envelope. please note: sometimes the padded mailers are out of stock, I tend to order these as soon as they get a wee bit low! These are great to use if you have something a bit bigger and heavier to ship a long distance (like Florida to California). Make sure you check the prices to ship in a “non-flat rate” or Regional Rate box before using this size, sometimes the other ways are cheaper! The large flat rate boxes are great to use if you have something a bit bigger and heavier to ship a long distance (like Florida to California). They are $17.60 commercially. Make sure you check the prices to ship in a “non-flat rate” or Regional Rate box before using this size, sometimes the other ways are cheaper! Okay, that is the scoop on the “normal” Flat Rate boxes! For sure if you have something heavy in your hands, check the cost of Flat Rate versus doing it by weight and size. 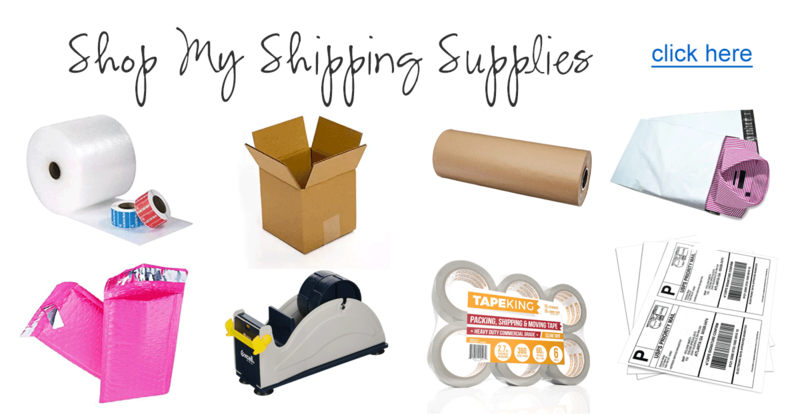 Sometimes the distance and weight will make shipping flat rate a super affordable way to ship! If you are just getting started with Priority Mail shipping, maybe the best thing that you can do is order the “combo pack” and get a feel of what the boxes look like! Now we are coming to what was, at the start, the most confusing thing to me about doing shipping… regional rate USPS boxes! Functionally, using these boxes rewards you for shipping closer to home. For example, if you had a large heavy 4 pound candlestick you were shipping from Tampa, FL to Atlanta, GA it might cost less to do it in a Regional B box (the two cities are close together) than to do it flat rate. There are two sizes of Regional Boxes, Regional A (small) and Regional B (larger). There used to be a Regional C box (it was huge) and there are some of these still floating around but they have been discontinued by the USPS and are no longer offered at the cheaper rate. 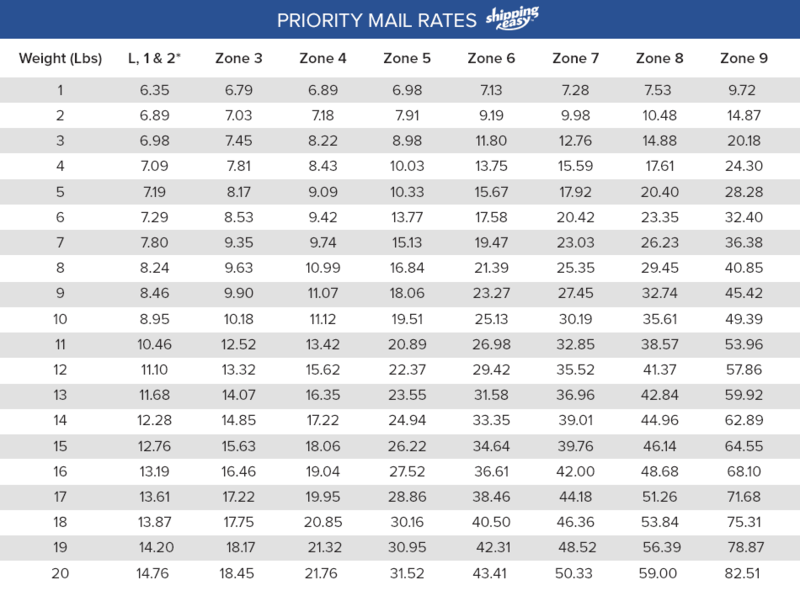 What Are The USPS Regional Rate Zones? 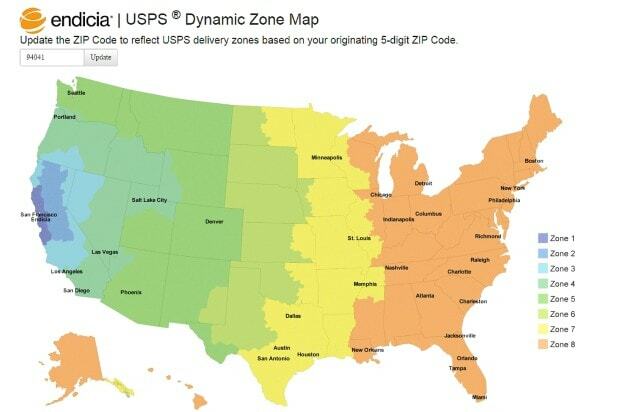 There are 8 or 9 Zones across the US that make up a grid of how much shipping will cost. So if you have something heavy, and they ask you to do free shipping or reduce the price, it is worth taking a peek to see if the cost will be lower and you have some more wiggle room! This happened to me… I had a fellow who wanted to buy these super cool old cast iron bookends and we got close on the price, but then he said he couldn’t go any lower. Well, come to find out, he was in my state and I could use the smaller Regional A box that made the whole thing doable on my end AND his! Note: You CANNOT just use these boxes for “regular” shipping. You have to use the shipping calculator that is in your Etsy or Ebay store and pick the “Regional A” or “Regional B” rate! When I was getting started, that is about all I understood about Priority Mail Shipping, that there were Flat Rate boxes and Regional Rate boxes and I thought if my product didn’t fit in there I was screwed, but there are SO MANY MORE free USPS Priority Mail Shipping Boxes! Whoo whoo! If you don’t see “Regional” or “Flat Rate” printed on the boxes, then you can use them to ship by what is called Dimensional Weight. This is where you measure the height, width and depth of the box AND put in the weight of the item being shipped and get the exact shipping cost of the item! If you go onto the USPS Store, you can see all the different boxes available, here are three of my favorites that I use over and over again! While I do use that Large Box 7 a lot, my all time favorite box ever is the 7X7X6 Size 4 box! That little box works so well for a variety of products! I KNOW, this was supposed to be just a Priority Mail post, but this one messed me up so much I have to share with you! Even though there are SO MANY different kinds of boxes you might get for free, sometimes something just won’t fit. In that case you can use any old kind of box you want! Yep! You heard that right, you can use any box at all and if you want to go above and beyond, you can even get snazzy stickers to put on your plain boxes that show it is Priority! Whew, that was A LOT! But if you can get this figured out you can save money on the cost of boxes AND also reduce your shipping costs along the way. I wrote this post to help some of the gals in my Facebook Etsy Group… it is fun, come join us there (it is free!) And also for the sellers I meet in person when I am teaching. Shipping can be so overwhelming when you are just getting started, it is worth taking the time to learn about it early! Last but not least… don’t worry that you will mess up… for sure you will! We all have funny horror stories about when we had to pay more than we made to ship something, but honestly that is how you learn!